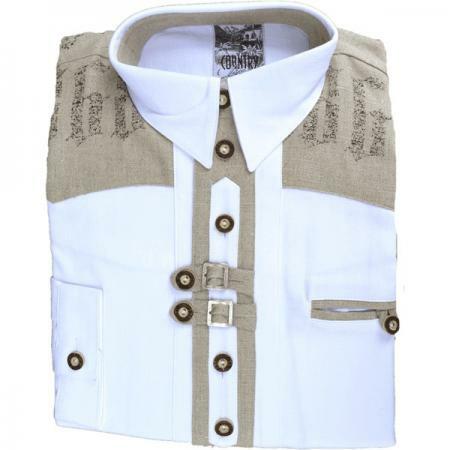 Men’s white and beige trachten shirt. Long sleeves. Features beige colored embellishments, stag horn buttons, and left side pocket. Imported from Germany. Please order by neck size. These suspenders come complete with breastplate and scalloped straps. To determine the length you need to order, measure from waist in front, up over the shoulder, to opposite side on the back. Order by centimeters. Made in the USA. This lovely tie ring is hand carved from authentic Stag horn and features an edelweiss carved in the center. Discontinued Men’s White Pullover Trachten shirt with pleats. Has fewer pleats than our other white Trachten shirts. Features long sleeves, stag horn buttons, and right side pocket. Made of 100% cotton. Imported from Germany.